Sinag Pilipinas defeats Indonesia 72-64 to win gold at 28th SEA Games 2015 Men's Basketball (+Full Video Replay) - Balita Boss! Gilas Cadets-Sinag Pilipinas beat Indonesia 72-64, in a rout to claim the gold medal at the 28th SEA Games 2015 Men's Basketball. 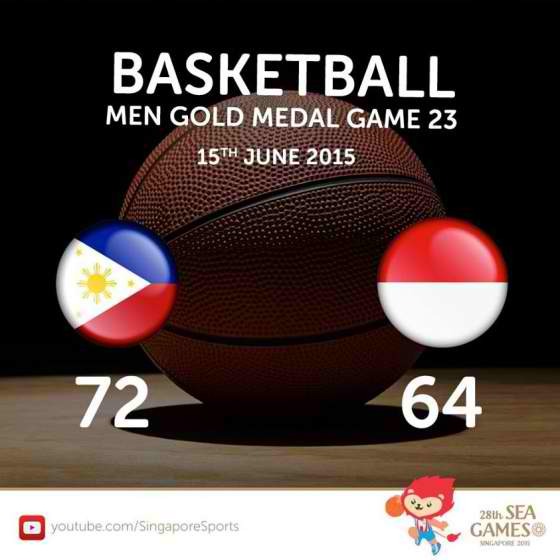 It was the Philippines' 11th consecutive gold medal and 17th victory in 18 SEA Games men's basketball tournament. Far Eastern University standout Mac Belo led the way with 22 points. Ateneo's Kiefer Ravena added 12, and National University standout Troy Rosario had 11 points and five rebounds. Sandy Kurniawan finished with 16 points for Indonesia, while Arki Wisnu contributed 10 points. Christian Sitepu added 11 markers. The medal of Sinag Pilipinas is the 29th Gold of the Philippines in the biennial meet, which also have 36 silvers, and 66 bronzes. The Philippine Team ranked at the sixth spot in overall medal tally with a total of 131 medals. Watch the Gold medal match of men's basketball between Philippines and Indonesia below.